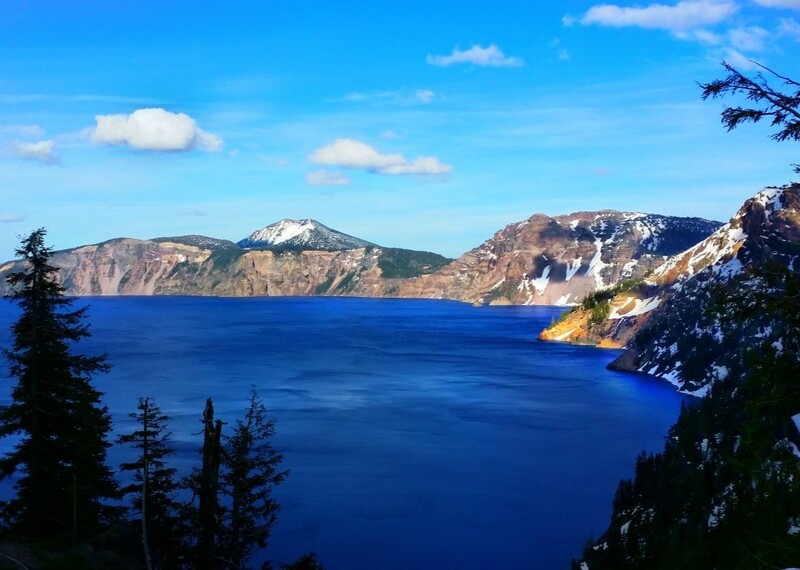 Crater Lake is one of the most amazing places in Oregon. I had only heard of it in the past and was attracted by the beautiful photos and documentaries I’d watched. 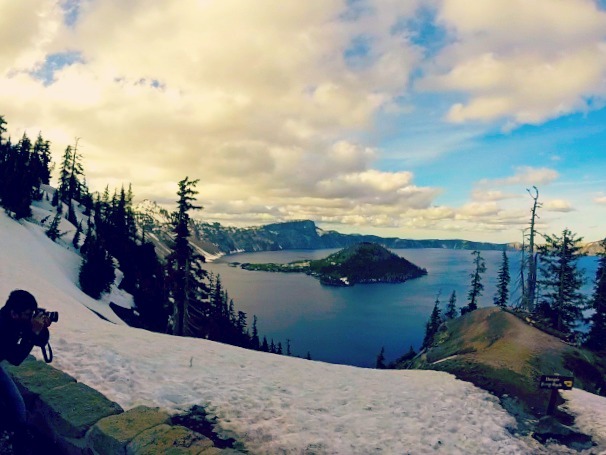 This gem is only a nine-hour drive from Seattle. No big deal. Ha! At least that’s what I thought. So naïve. I had the crazy idea to venture out into a three-day road trip for Memorial Day weekend by first traveling six hours to Painted Hills and the next day another three hours south to Crater Lake. Don’t do it, guys and gals! Not like this. First, the John Day Fossil Beds National Monument is a trip of its own that I am sure can take an entire weekend in itself. 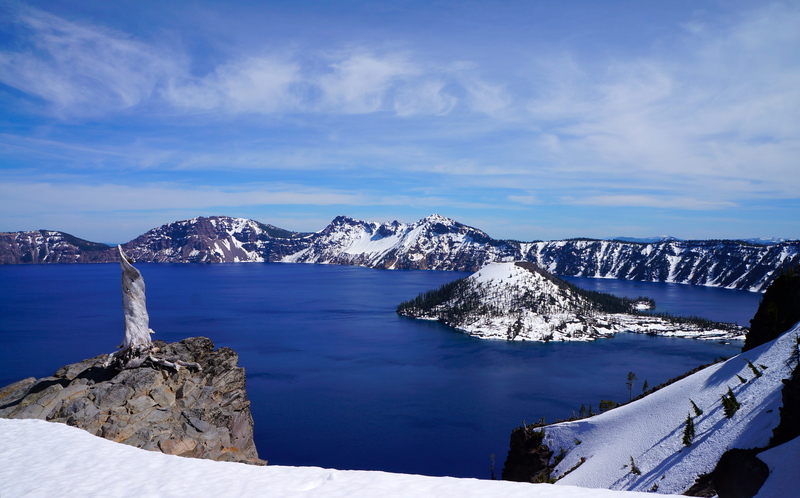 And second, Crater Lake is also an entire national park that requires your undivided attention. I do not plan. Remember that. With very little sleep because of my terrible stomach pain, we made our way out of the little town of Mitchell. 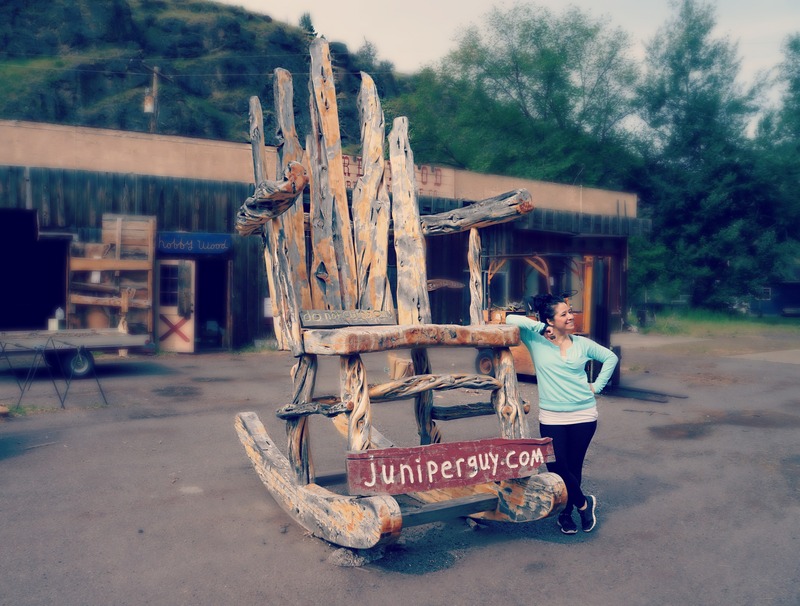 Look at that ginormous wooden chair! So cool! We left later than expected…because of my terrible stomach pain, yes. I was so tired and kept sleeping! So we knew our three-hour drive to Crater Lake would be a slow one. We also had to make constant stops to let my car cool down and fill her up with fresh coolant. And when we finally made it to Bend, OR, we were relieved to see that it was a larger town with businesses open on a Sunday. Yes! No mechanics open, but an auto parts suggested a sealant for the cracked radiator. Surprise, surprise – we were like the fifth people to stop by with the same issue. Hold up! Are those lava rocks along the side of Highway 97?! YES! That was our reaction when we saw an entire mountain of lava rocks while leaving Bend, OR. And so we took the detour. Plus my car needed a break. We thought this was a small viewpoint. Ha ha ha. 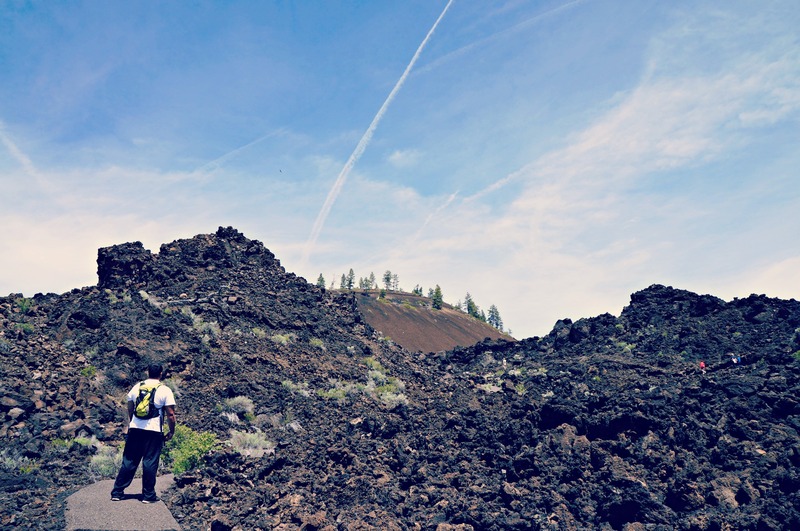 Turns out it was the Newberry National Volcanic Monument, which is pretty big. I wish we had more time for this. 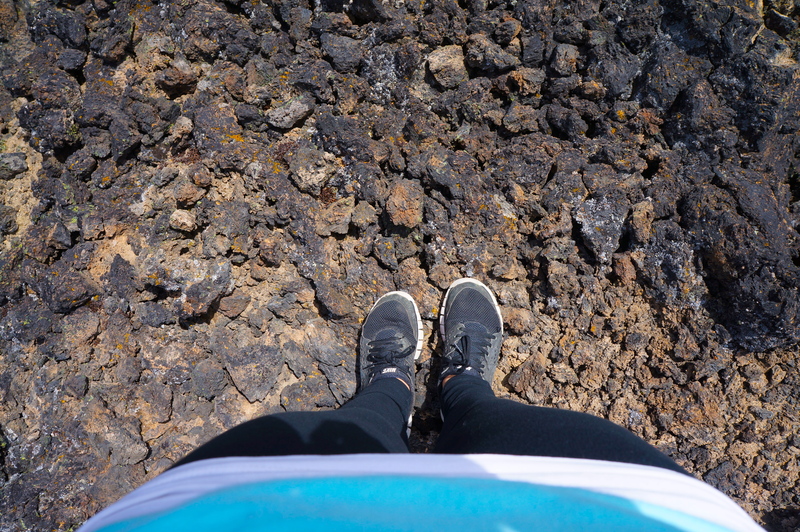 There were several trails to different sections of the lava flows, including one to caves! But let me take a step back. We were in the middle of a 500 sq mile active volcano! 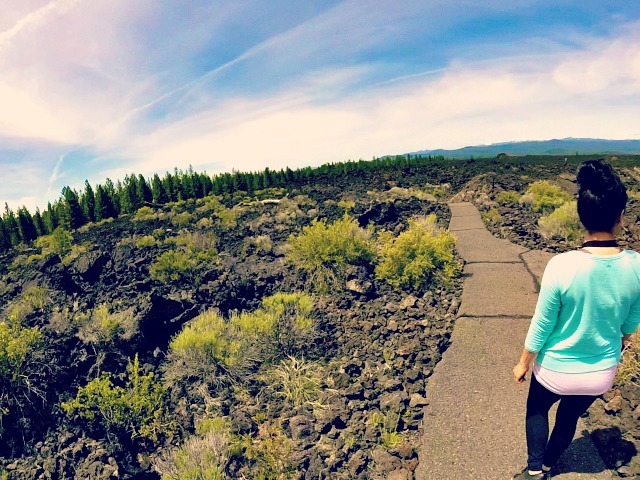 It was unbelievable to be standing among lava flows created over thousands of years ago, with life still thriving. Insane. It was a first-time experience, and it really was quite hard to fathom…And I didn’t have to fly to Hawaii for this. Is it not incredible?! Mother Earth does it again. She’ll take your breath away without even trying. 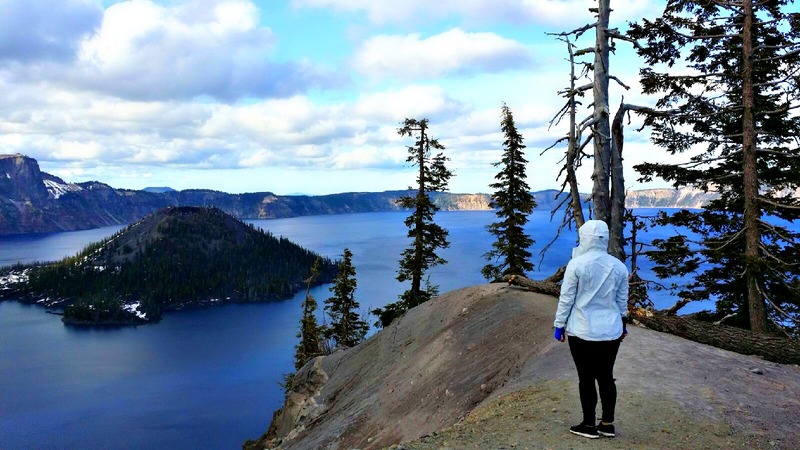 If Crater Lake National Park is not in your list of places to visit, it needs to be. 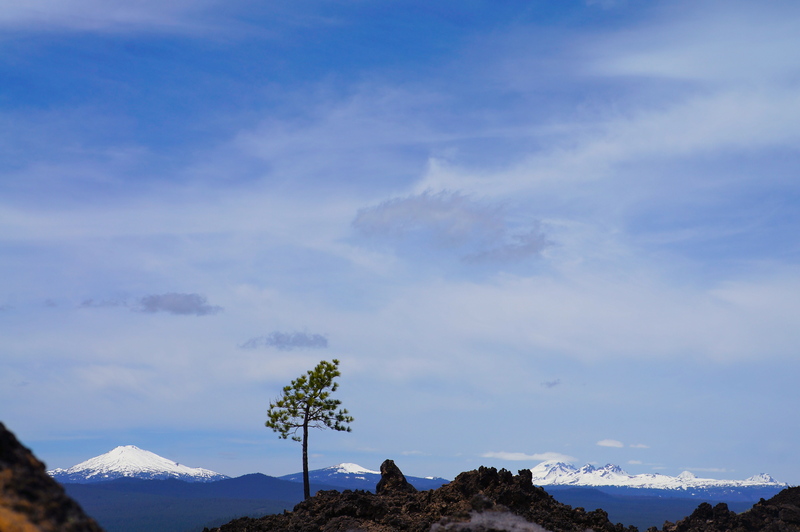 This piece of paradise sits in Central Oregon and is the result of a collapsed volcano. 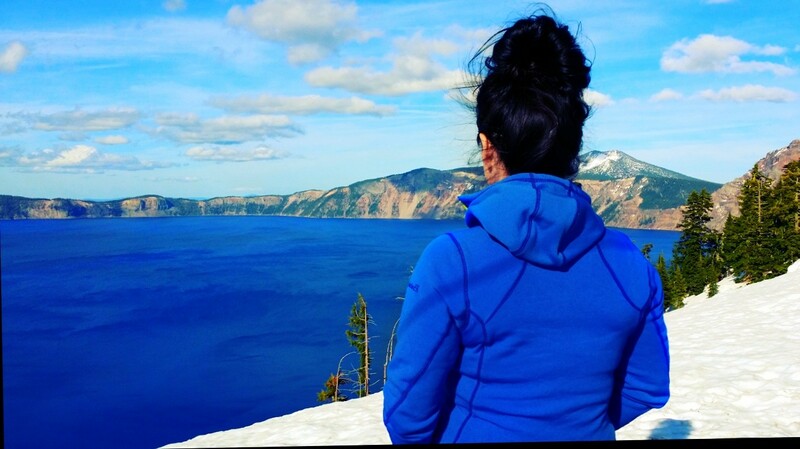 It is also the deepest lake in the U.S.A. and has some of the most clear, blue water! I was surprised to know our park pass was good for seven days. And no wonder! This place has so much too see! 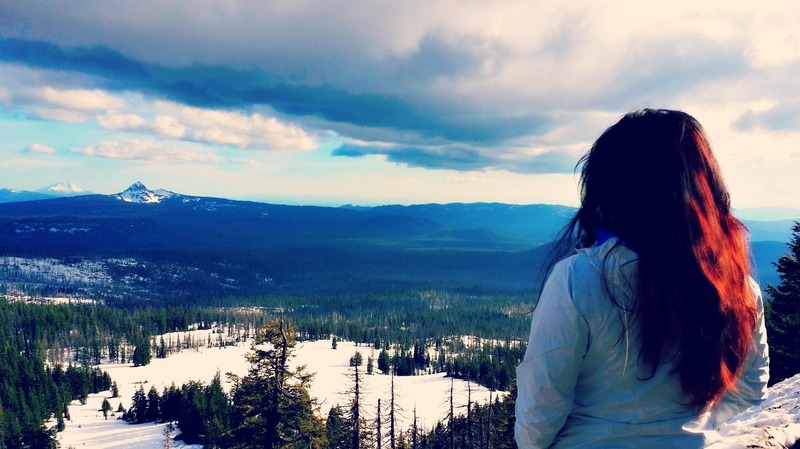 Crater Lake has several trails and must-see places, like the Pinnacles. It’s too bad we were too early in the season and as you can see, there was still plenty snow. All the trails were still inaccessible and the weather changed drastically within minutes. So my suggestion to you — wait to make the trip until later in the summer. I think I may just make another road trip out there before summer ends. Needless to say…there was no swimming in that 70+ degree weather. Ha! But we’ll be back. 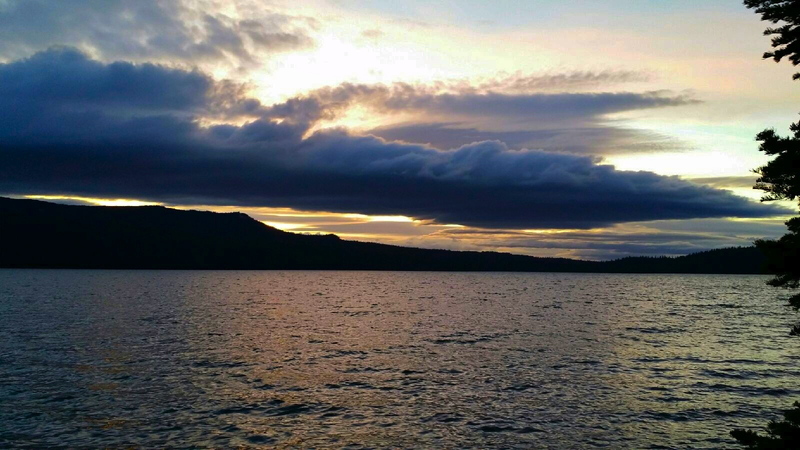 Once the sun began to set and the weather became cold and windy, I hoped that the lodge still had available rooms. There was no way we’d be camping in the snow at some eight thousand foot elevation…Not that there were any campgrounds open due to snow. 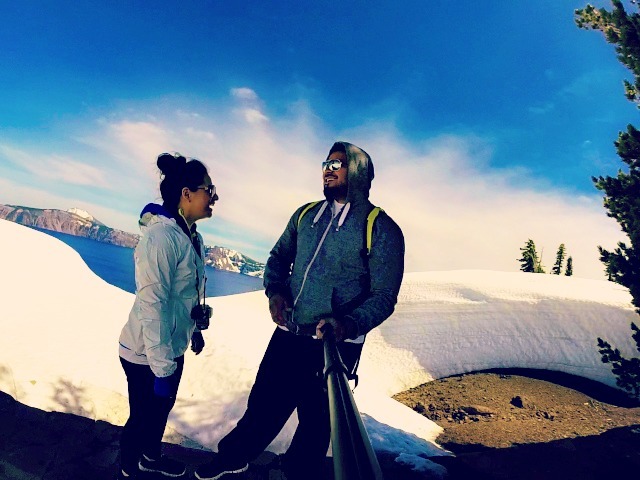 The Crater Lake Lodge was completely booked, so instead we made our way out the park and onto Diamond Lake. Part of me was hoping there were also no rooms available at the Diamond Lake Resort so that we could instead enjoy the outdoors, but the other part of me was hoping for a warm bed that night. And I’m so glad no rooms were available! (Unless I wanted to pay over $200 for a two-bed). 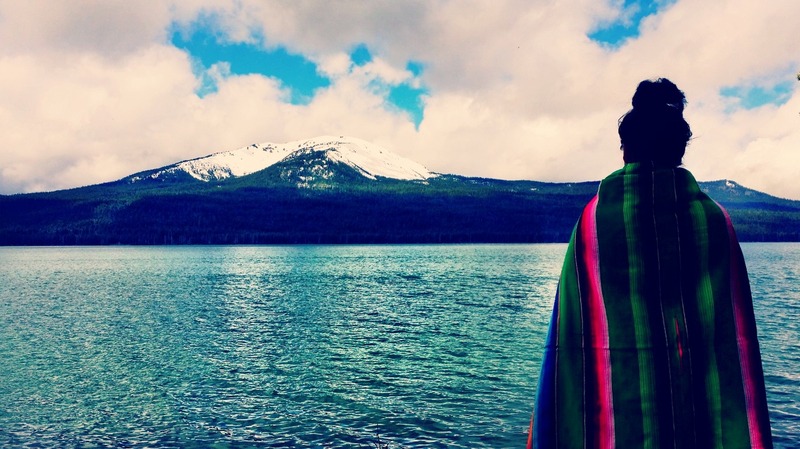 I was also relieved to know we were not the only crazy ones camping with snow across the lake. Snow on the mountains, that is. Plus, now that we were at lower elevation, it was no longer freezing. And hello waterfront views! Did I mention that this weekend I experienced my first real camping experience? That’s right! 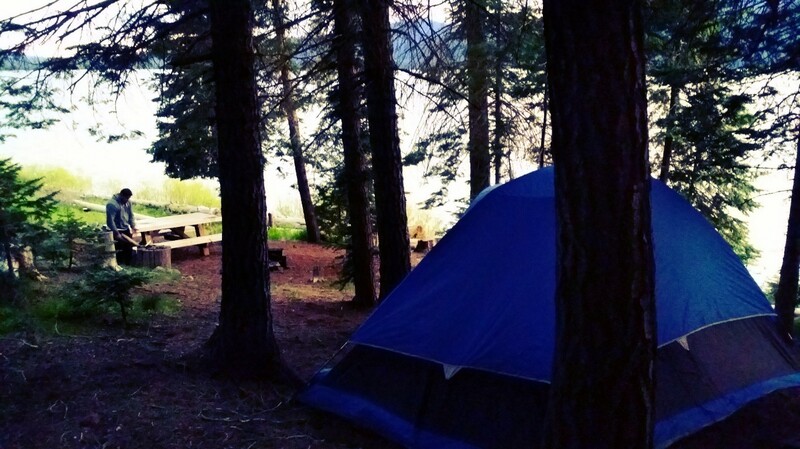 And this camp ground at Diamond Lake was everything I had ever imagined. This particular campground was quite big and spread along the lake side off of Forest Road 4795. There was plenty space between each camp site to give everyone privacy, but not so far out to feel alone and completely vulnerable (ha ha ha!). Several bathrooms and showers were spread throughout the campground, as well as drinking fountains. There were also plenty logs for fire-burning. I’m not sure if those were left behind by other campers or if the campground provided some, but we had plenty to burn throughout the night. It was also nice to have a minimart and deli down the street. Makes things so much easier for travelers! 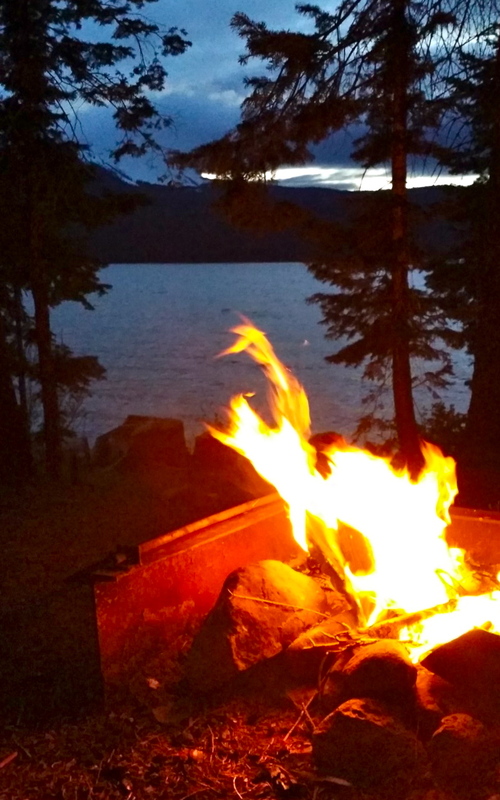 Watching the sun setting over the lake — with campfire and my love sitting by my side — was everything. It has to be one of the highlights of my summer. And what a beautiful starry night…take me back. We packed our tent the next morning at around 11AM and were so ready for the nine hour drive back to Seattle. We were really missing the furry kids! 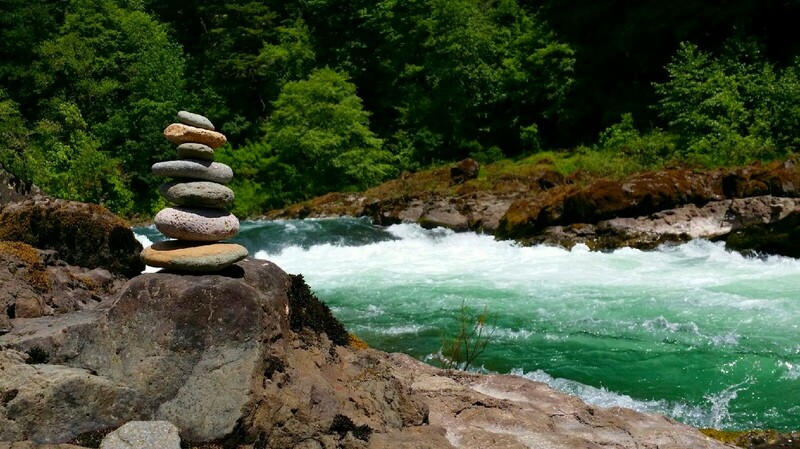 Along the way, after descending however many miles of elevation and before reaching Roseburg, OR, we spotted a perfect picnic location along the Umpqua River. We probably spent about an hour there, eating, enjoying the river, and waiting for my car to cool. We did encounter some really heavy traffic later on I-5 due to two different accidents, as well as the holiday traffic in general. We got back to Seattle at 3AM, and yes, I had to work the next day. But what a trip it was!!!! – Rent a car. If the trip is longer than 4 hours, I am definitely renting next time. – Pack healthier food. Too much junk food was probably the cause to my terrible stomach pain. 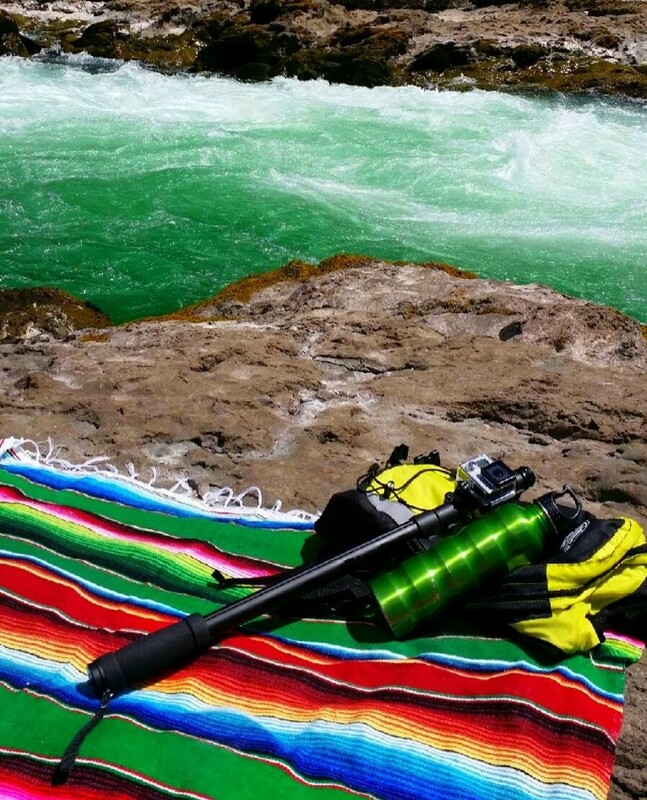 – Pack an extra charged camera battery. Did I really think my camera would last three days? – Always pack the tent. I have never seen so many campgrounds throughout the area. Ever. – One trip at a time. Painted Hills deserves its own trip. 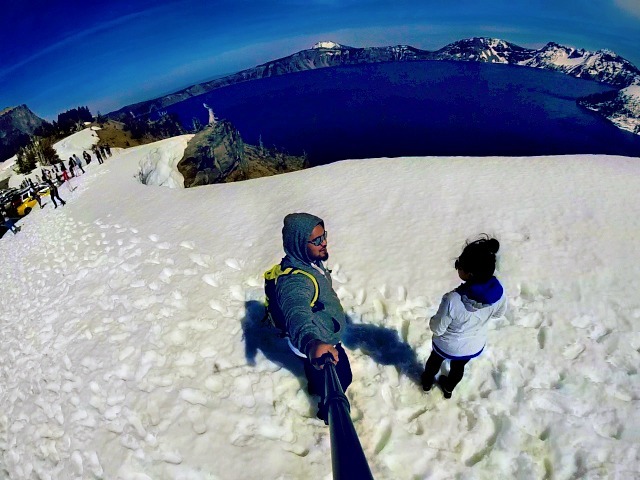 Crater Lake deserves its own trip. Don’t do them together unless you have lots more time than I did. Haha! – Pack extra car coolant, oil, etc. Yeah, I also thought my car was invincible and could handle any road trip. – Grab a map. A real map, bc cell service is sporadic. 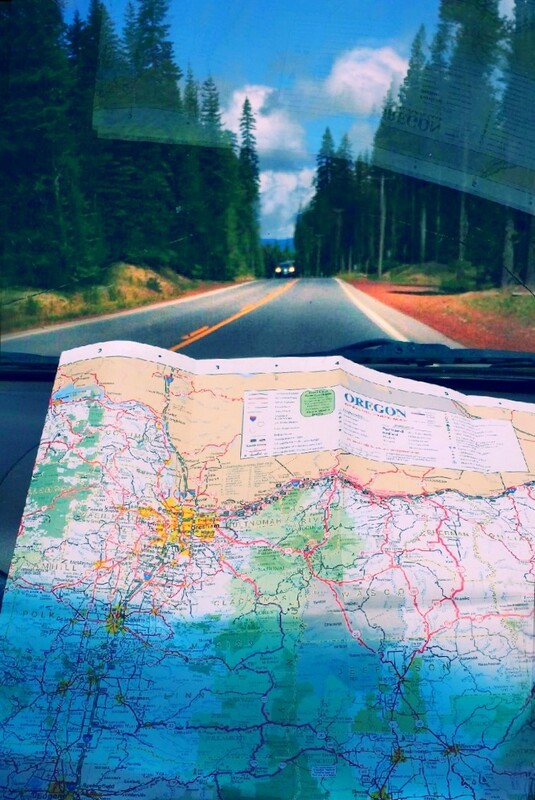 Oregon treated us to a free map and really helped us on our drive. – Don’t forget your health insurance cards. Anything can happen, and that’s reality. 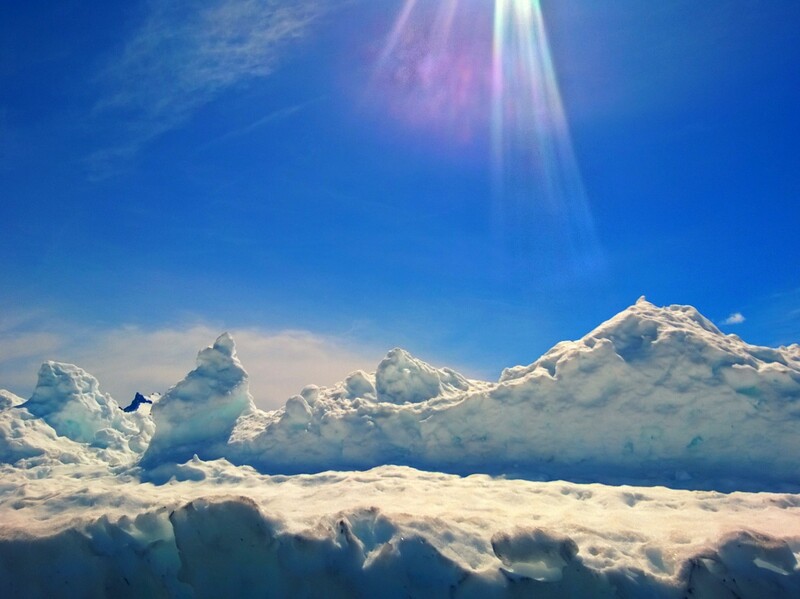 – Carry an adventurous attitude! : ) You’ll be ready to face any situation and not let that defeat you on the road. I am so grateful for the time we spent on and off the road this Memorial Day weekend. This trip was not planned, and instead we threw ourselves onto the road not knowing what to expect out of the trip. If you read my previous post for the first half of this trip to Painted Hills, you’ll know that we encountered car issues (and stomach issues) and lost a lot of time. But we made the best out of it and even found places we did not expect to visit. 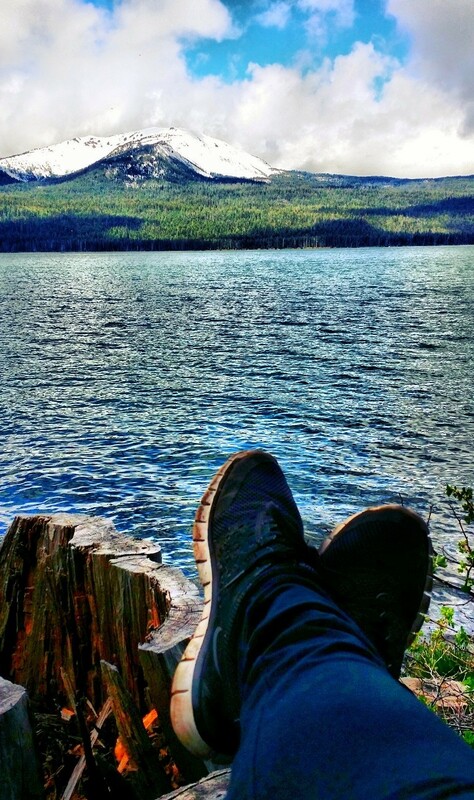 When was the last time you did something completely spontaneous? So many times we let fear and uncertainty hold us back from a lot of things we later wished we did. Don’t let that happen to you. We have one life and one time…And that time is now. We all have different stories and different goals and dreams we may be working towards. But don’t let that stop you from enjoying today. Today will never happen again. Below are more photos from our trip. Enjoy! Walking among the lava lands. Amazing views! Id never seen so many different mountains as I did on this Oregon trip. Loves. See that peak in the back? 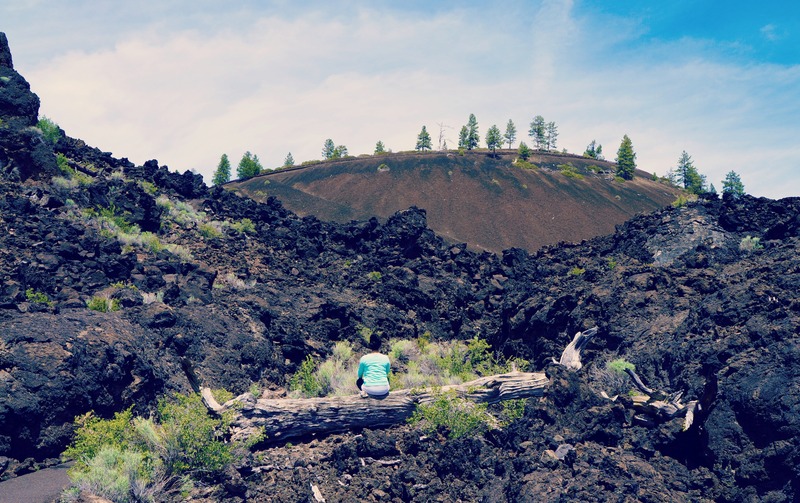 Thats the lava butte. We didn’t walk all the way up. Next time. 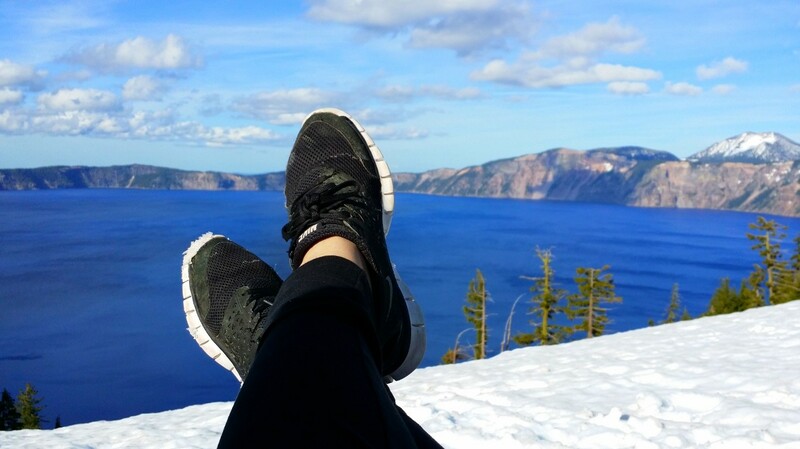 At one of the Crater Lake overlooks. We couldn’t believe so much beauty was real! Unbelievably beautiful. And yes, thats how smooth and still the water was. Still shot from the GoPro. Sorry for the color. It was a bit dark and I tried to lighten it and hence the yellow snow. Hehe! It really is a photographer’s paradise. From any angle and any time of day. The valley surrounding Crater Lake. This is were most of the campground would be. I think. And yes…lots of snow in May. Yikes! 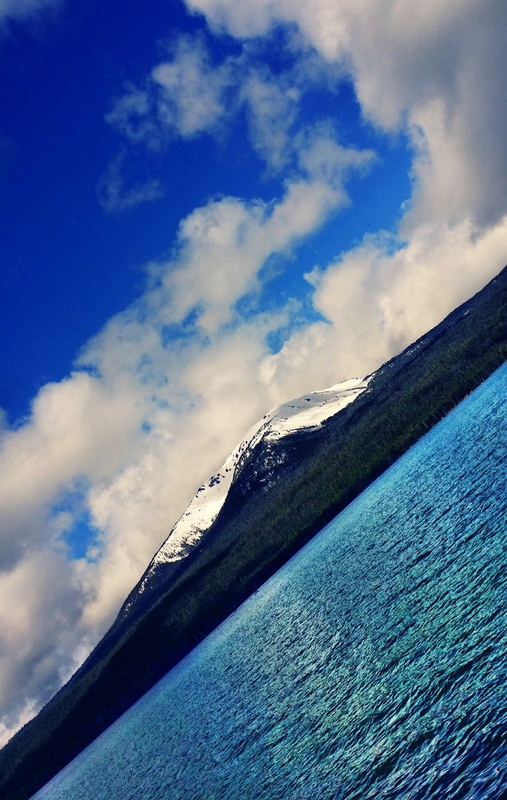 Diamond Lake. Camping with a view. Our treat before ‘bed time’. The smell of burning fire…one of my favorite smells. HAHA! Well, we were camping. What did you expect? Dirty shoes!